The weekend of 19th- 21st November will be remembered as an important one in the history of the school and one that will be etched in the minds of 25 young adults. 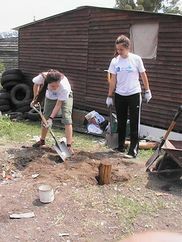 These 25 students (Y 12) participated in the school’s first ever construction of houses with the Un Techo Para Mi Pais organisation. After raising over $18,000, enough to build three houses, and preparing for the weekend of work, we set off on Friday evening to Barrio Ringuelet in La Plata – the site of our building project. No one was quite sure what was in store although our hearts and minds were filled with high hopes and expectations. We were not to be disappointed! After assembling with a total of 250 students from other schools in Buenos Aires we were dispatched to a school in the Barrio of Ringuelet, which was to be our base and place of rest for the next three days. The evening was spent developing bonds of friendship with the other students and being ‘introduced’ to the families whose houses we would be building. Early Saturday morning we set off to our construction sites with tools, building materials, food and water to keep us supplied until dusk. 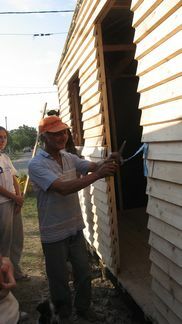 The work was hard but great fun, with everyone in each construction group pitching in to help and support each other. By the end of Saturday, each of the three SASS houses had their foundations and floors in place! Sunday was another full day of work, fun and friendship. The day was long, with lots to do, but the sense of camaraderie ensured that when you were tired someone took over, when you needed help someone was always at your back to support you. Although we worked for over 9 hours in the baking sun the time flew by and there was a strong determination to complete the task in the very best way possible. By 6pm all the houses had been completed and a small inauguration ceremony took place with new owner of each house. This was extremely emotional and the feelings and memories invoked by this moment will be etched into the hearts and minds of all who participated in weekend of work! It was a truly unforgettable opportunity and several students have written, expressing their feelings and memories from Un Techo Para Mi Pais 2010 and illustrates, in the best way possible, the importance of this experience. To learn some more on their unforgettable experience please click here.